What happens when you listen to your life. This week, while on vacation, I’m sharing the very first excerpt I published last year before my latest book, Waking Up in Winter, was released. I can’t tell you how many times I’ve reread this journal entry to remind myself of the little things that are really big things, as well as the importance of honoring the priorities that matter most to me at midlife. P.S. 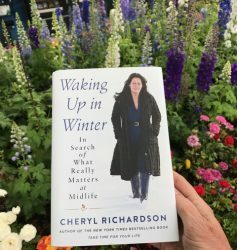 – There will be no Facebook Live broadcast while I’m on vacation this week, but you can watch past sessions on my YouTube channel at CherylRichardsonTV here.